Stuck in the middle – Anywhere between 35 & 55? Midlife Crisis Warning! If you are anywhere between 35 to 55 years old and suddenly you find yourself looking back at years gone by, recalling obsessively your youth, doubt yourself and the person you have become, have this burning desire to feel or look younger, feel you haven’t achieved your life’s goals, find yourself doing things you haven’t done in years, making impulsive and irrational choices, then this article is precisely what you need to be reading. How often have you come across someone who suddenly does something completely out of character? Like unpredictably deciding to embark on an affair while happily married. Like suddenly starting to dress in a flashy manner which is not their usual style. Like impulsively making wrong financial decisions. Faced with the sudden desire to live life to the fullest, a man may decide that a new BMW makes perfect sense (despite it being well outside the family’s finances). He may decide that he absolutely must leave the job he was quite satisfied with just a few months before. Everyone changes in life but during a midlife crisis these changes can be extreme and seemingly come out of nowhere. 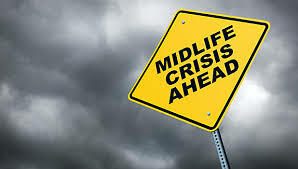 The Midlife Crisis is more common than we like to think……it happens all around us, to us, but we fail to recognize, accept and deal with it. Which is why what could be simply a time of reflection and growth becomes a traumatic phase that can have disastrous consequences. • What exactly have I achieved with my life? • What am I to do with the rest of it? • What is there to look forward to but old age, infirmity, and death? This experience is a combination of feelings, events and body changes that indicate a transformation is at hand. A person experiencing this could have a few or most of these symptoms: Unexplained bouts of depression when doing tasks that used to make you happy, changing or investigating new religious ideology, unable to concentrate or complete tasks, a sudden desire to get into physical shape, irritability, unexpected anger, excessive reminiscing about youth and previous loves, desire for physical –Free Flowing– movement (Running, Biking, Dance, Fast red sports cars, Sky diving, etc), exploring new musical tastes, obsessively listening to music you listened to in your youth and sudden interest in new hobbies. People going through this phase may start questioning everything in one’s life, feeling trapped or tied down by economic or family responsibilities. Changes in tastes and habits are common. So is taking more time to look good, paying unusual attention to your hair or clothes, and hanging out with a different generation as their energy and ideas stimulate you. Physical changes could include a change in allergies, shifting sleep patterns, loss of appetite, and general malaise. People who are emotionally unstable are more prone to Midlife Transformation. Most of us go through it but those who cannot mitigate it have extreme reactions. Stress can trigger it, like Changing Jobs, Divorce, Death of someone close and experiencing a major illness. One hears clichéd comments like how after a man hits the big 40, it is time to watch out, as he may indulge in erratic behaviour and romantic escapades. Do men experience Midlife Crisis more commonly than women do? Arguable, as Asma opines.” Men react more strongly to it. The reason for that is that men don’t experience any major changes in their physical or hormonal state as compared to women. Men only experience Puberty and Andropause, whereas women after puberty go through PMS (premenstrual syndrome), Child birth, post natal depression and Menopause.” Therefore, debatably, women handle change better. The worthwhile question would be how can one handle this traumatic phase in ones life? “Recognition, understanding and acceptance,” answers Asma. One needs to put more energy into the marital relationship, focus on strengths instead of regrets, look forward instead of backwards, get fit (Sleep, rest, exercise and eat right), and get counseling if things get out of hand. A midlife crisis is a natural biological and psychological process of a person maturing. While some of the symptoms might indicate a process opposite of maturing, at times a person needs to step backwards in order to move forward. Everyone changes to evolve within their life as they get older. The truest resolution is learning to embrace the change. Posted in Just Like That and tagged Carl Jung, Middle age, Midlife Crisis, quarter age crisis. Bookmark the permalink.